Real Women of Philadelphia Community and a Coupon! I love food and well I also love coupons! I am a huge internet/community fan and some days I could spend hours online looking for ways to save money, reading product reviews, meeting fun and interesting people to chat with and new recipes to try. I want to tell you about a great community of women, Real Women of Philadelphia is a great little site where you can share recipes, videos, a community and forum. There is a contest on right now to find the next Real Women of Philadelphia. It's a cook off kind of contest. Each week there is a different theme and it runs for 8 weeks. This past week was Dessert. 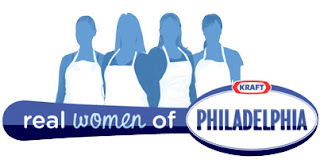 Each week two finalist will be chosen and will go to Toronto on an all-expense-paid trip to meet Anna Olsen in July, and compete in the cook-off event for the opportunity to be named one of the Real Women of Philadelphia. Four finalist will be chosen at the cook-off, who will host the website by starring in their own cooking videos, participate as a contributing editor within the community and contribute to an online cookbook for the next 6 months. In addition, each of the four finalists will take home $20,000! There are three weeks (Side Dishes, Entree, and Dessert) left so start cooking! Submit your recipes at Real Women of Philadelphia.ca. If that does not interests you but you still are looking for some new recipes, share some of your favorite recipes, coupons and meeting new people, head over and sign up. Don`t forget to get your $1.00 off Any Philadelphia Cream Cheese, there is a spot on the right hand side to request your coupon.